The benchmark in single stack traps. Due to the stainless steel/aluminum construction, no other automatic trap thrower will outlast the AT50. The fully automatic Atlas Electronic Thrower lets you easily create a professional quality trap range at virtually any location. Constructed of stainless steel and powered by a 12-volt battery (not included) it smoothly launches standard clay targets up to 70 yards. 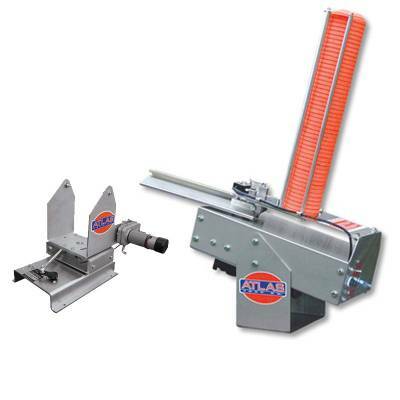 This Made in USA trap comes with a 5-year warranty plus a lifetime warranty on the DuraClutch and electrical system. And since it's engineered with simple yet reliable electronics there's very low battery drain. Heavy-duty construction combines with a rust-resistant stainless steel frame and mount to ensure years of shooting enjoyment. The Wobble Base makes for a more challenging shoot. Increase your skill to a higher level by firing at random vertical and horizontal targets. Conforms to ATA Standards & has an On/Off Toggle Switch.